Alright, if you read my first blog, you get it, beetles are numerous and diverse. But this is just an oddity, and beetles have little relevance to the way our planet works, right? Wrong. Beetles are incredibly important to the systems that we depend on. For example, the saproxylic beetles, of which there are thousands of species, are intricately linked with wood decay in many ecosystems. These guys play an integral part in the decomposition of logs, helping to recycle nutrients back into the ecosystem. They also play an important role in providing habitat for other animals such as native mammals and reptiles by hollowing out nice places to live. They also turn wood into food for those animals that dine on the beetles themselves. 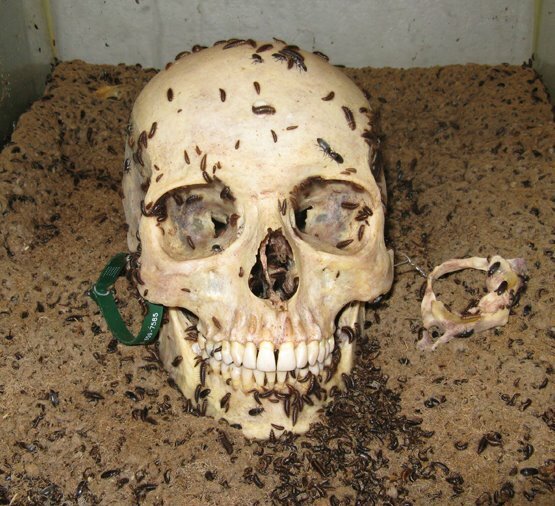 Carrion beetles do a similar job with dead bodies. They are often first on the scene to munch on a corpse, breaking it down, enabling smaller carrion organisms to complete the task of consuming the whole thing – my colleague is working on these beetles at the moment and the lab stinks – to maintain his paranoia, I keep telling him that it’s him ;-). Dung beetles also work in a similar way but their preferred medium is poo. They are crucial in many ecosystems, including agricultural systems, in breaking down large herbivore dung and recycling nutrients back into the soil. The Ancient Egyptians had a special appreciation for dung beetles – they thought a huge dung beetle was responsible for pushing the sun (a very hot and bright piece of poo) around the sky! Beetles play an integral part in nearly all terrestrial ecosystems: they pollinate plants and disperse seeds, fungi, parasites, bacteria and many other life forms. They are also a food source for other animals including, well, you name it….thousands of species of birds, reptiles, mammals, fish, amphibians and invertebrates. So beetles are very important. I’m trying to imagine a world without beetles. For a start, many of our native animals would have fewer hollow logs in which to take up residence. Trees would not break down, at least not as fast, reducing nutrients that are crucial in forest ecosystems. Poo wouldn’t break down as quickly meaning that soils would not receive as many nutrients and would quickly degrade. By leaving poo everywhere, we’d be providing habitat for diseases and parasites galore. The place would stink as remaining species struggled to break down corpses in as quick a time. Lots of beetle dependant plants would not get pollinated. Lots of animals that eat beetles would not exist. Our runner beans would all be covered in blackflies. The sun would never rise (according to the Egyptians). In fact, many ecosystems would probably just collapse. OK, this scenario is an oversimplification and I’m not suggesting that beetles are going to be wiped out. Well, I hope this isn’t possible, as we’d be pretty much screwed without them. John is a PhD student at the Fenner School of Environment and Society at the Australian National University. His PhD work involves exploring the world of our coleopteran cousins, the beetles. John is studying how fragmenting the landscape affects how beetles move through that landscape and whether this has anything to do with their survival or extinction. He gets to spend lots of time deep in the forest in the middle of nowhere ‘at one’ with the trees, kangaroos, wombats, gliders, cockatoos, bull ants, snakes and falling limbs. He also spends lots of time peering down a microscope trying to distinguish between indistinguishable species of beetle. After a youth misspent cheering on Derby County Football Club from the East Stand at Pride Park Stadium in the British midlands, he sometimes wonders how he managed to arrive at such a remarkable place doing such a captivating and fascinating vocation. The question is not ‘what would a world without beetles be like?’, its how many beetles can we lose before we see a loss in ecosystems function. Until we stop taking it for granted that declining biodiversity has consequences, the decline continues. Thanks John for an entertaining exploration of why beetles count.